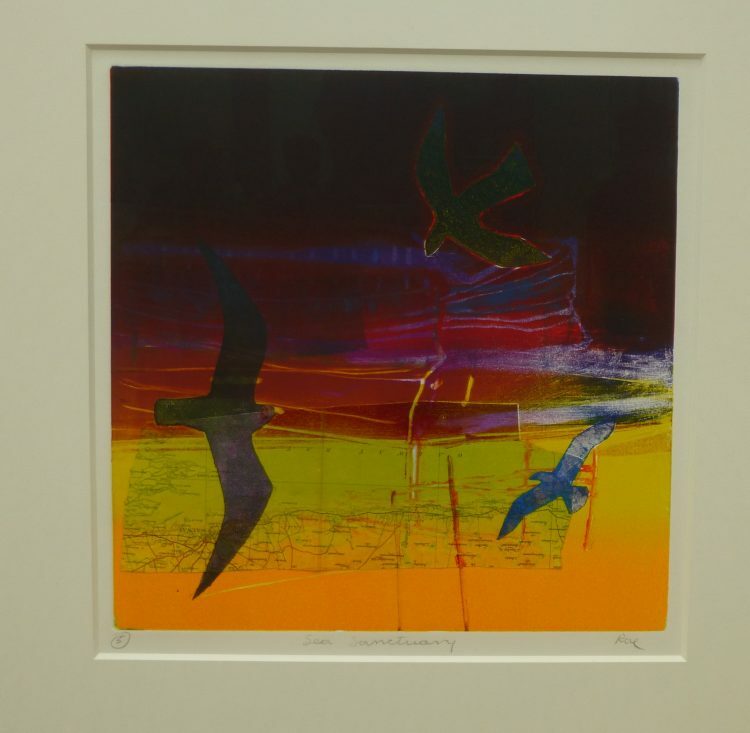 Off on the train to London yesterday morning with Graham, to the Royal Academy Summer Exhibition. There is nothing really spectacular in the courtyard this year, unlike the Spyre last year, or the metal ‘forest’ of the year before. So we went straight in. The hanging seems better this year. I remember last summer being really irritated by the tiny paintings hung so high they might just as well not have been shown. This year there was one of the fairly large rooms devoted to a lot of smallish paintings, and everything was ‘viewable’. My favourite Academicians did not disappoint. 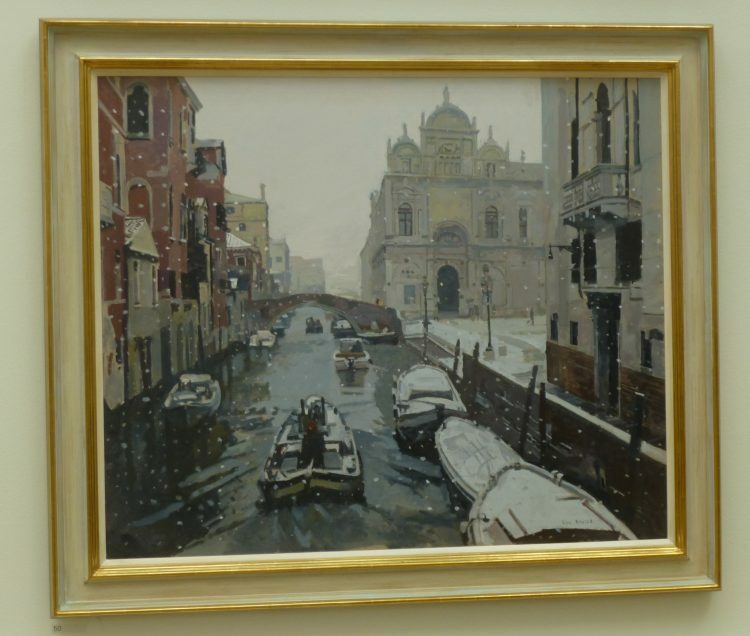 Ken Howard RA had two lovely oils in the first big gallery both showing scenes of Venice. I particularly liked the snow effect one. 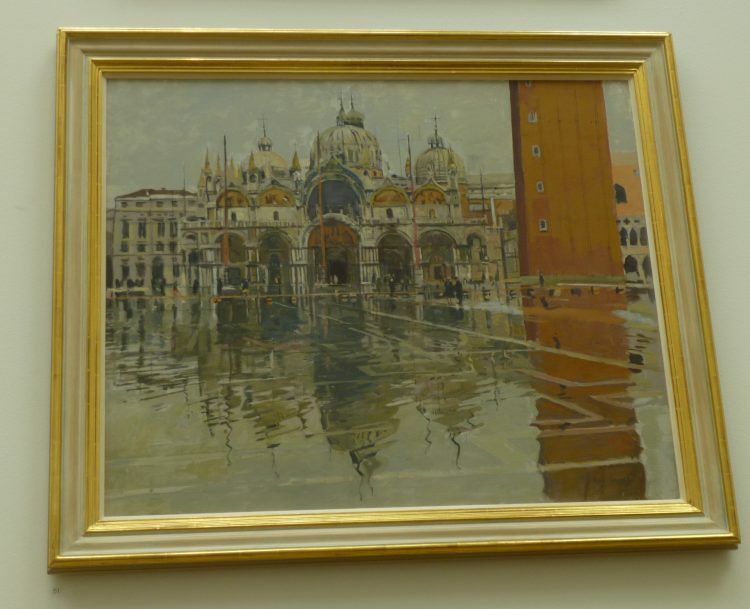 Further on I found this smaller one by Ken Howard, Rio Della Fava, Venice, which was actually my favourite. 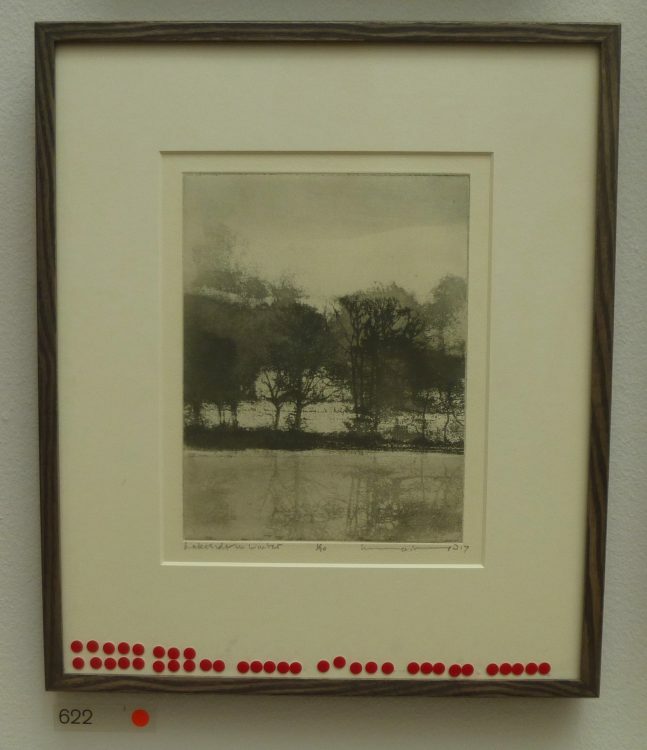 Norman Ackroyd RA had a number of beautiful etchings. 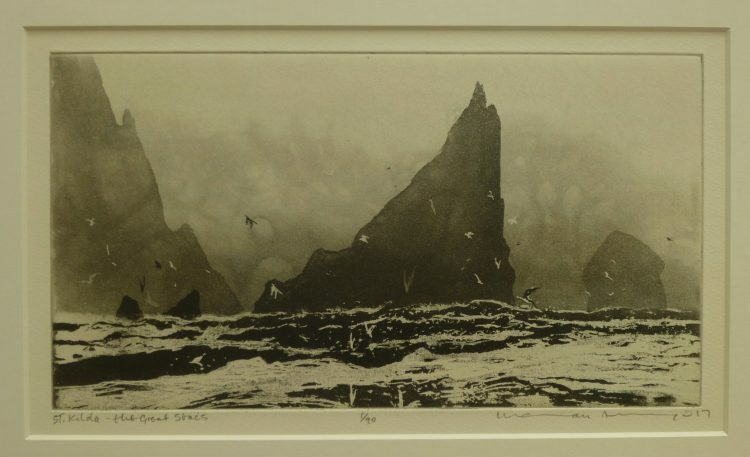 This one is called St Kilda – the Great Stacs. And this was just called Lakeside in Winter. We found four works by Barbara Rae RA which we both liked. Here are two of them, Sea Sanctuary I & II. 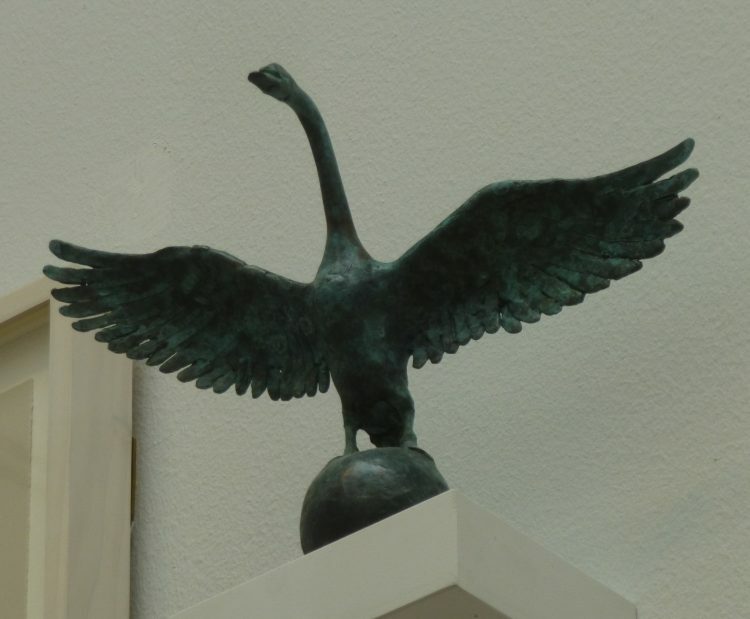 I really liked this small bronze of a swan, called Swan on Ball I by Tim Shaw RA. What a pity it was positioned so high on the wall that it was impossible to see the detail clearly. This photo was with zoom lens on my camera! 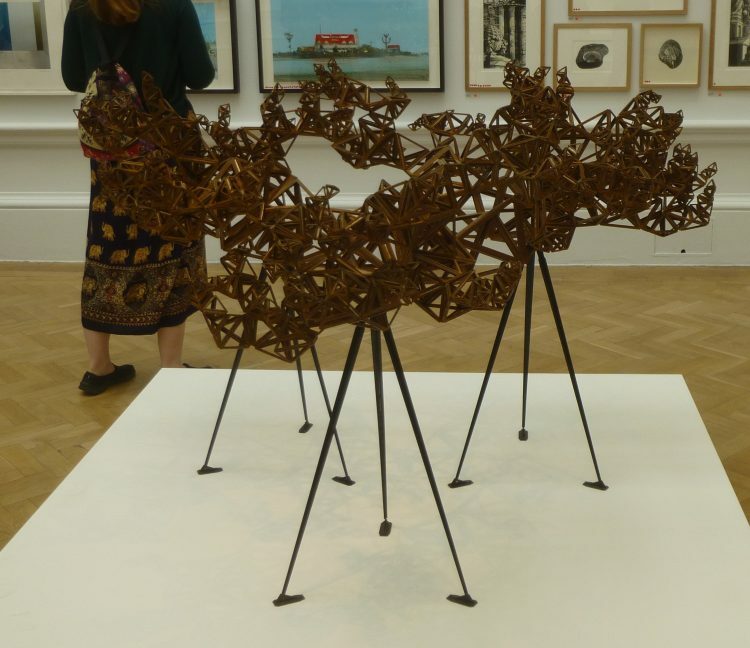 Another intriguing sculpture was a mini version of the metal forest from the courtyard in 2015 – The Dappled Light of the Sun (Study 1) by Conrad Shawcross RA. 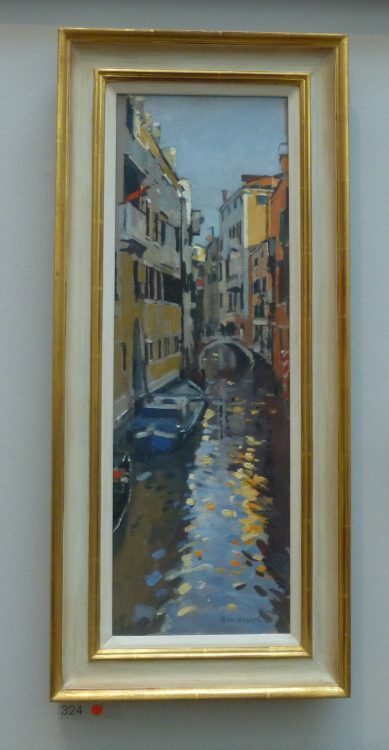 There were a number of very small, very beautifully done works – Henry Haggar’s Sunlit Cloister Gloucester Cathedral was lovely, and I really liked the style of Neil Bousfield’s Walking the Tideline. There was a lot of photographic works last year, but very few this year. 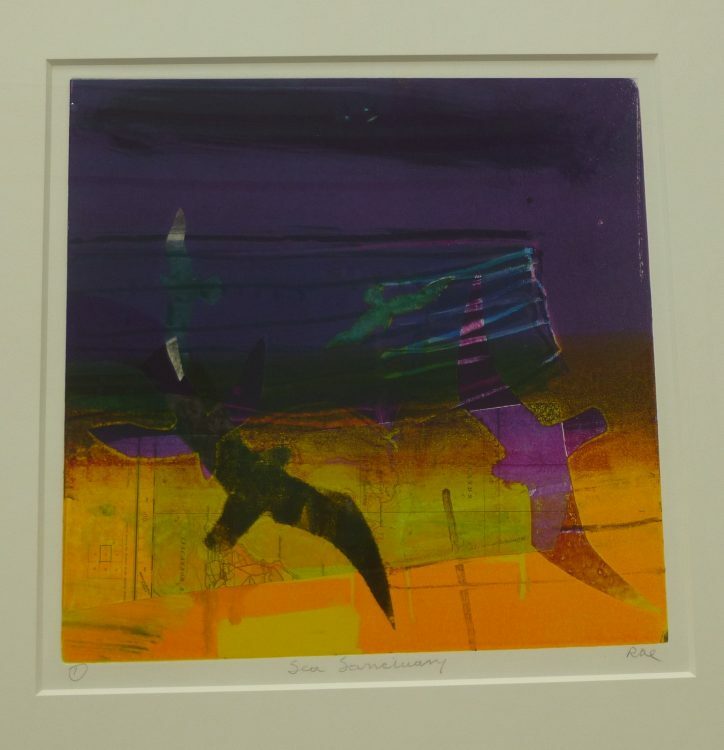 And we both noticed that the small representational works had sold really well, but the abstract, mostly quite ugly – or very ugly! – and sometimes HUGE!! – works had not. Not really rocket science! As always it was a very mixed show, but definitely worth a look if you can get into London. I bought a beautiful scarf with a design by Barbara Rae in the shop. Maybe a photo to share tomorrow . . . 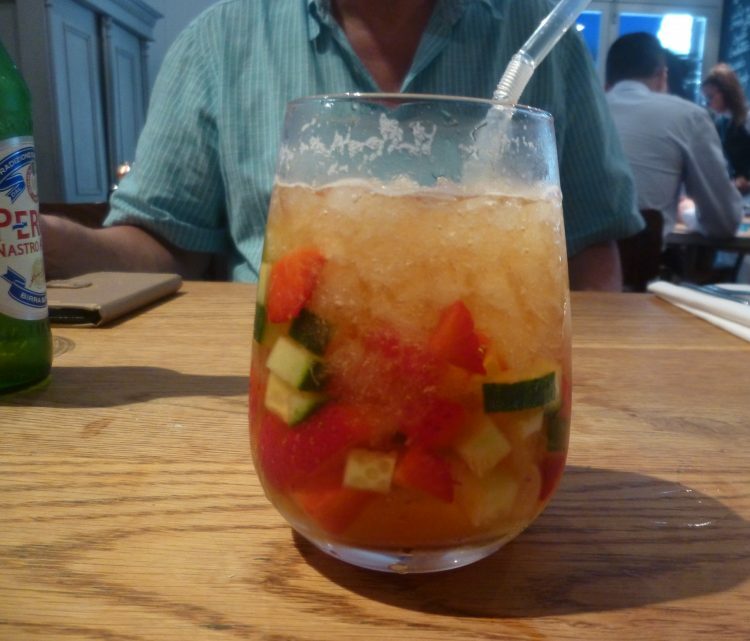 Afterwards we had a delicious lunch in Fishworks, and I had a delicious glass of Pimm’s!